They were caught in a public feud last month when Megan Barton-Hanson claimed it was 'unmanly' to wear sequins on the ice rink. 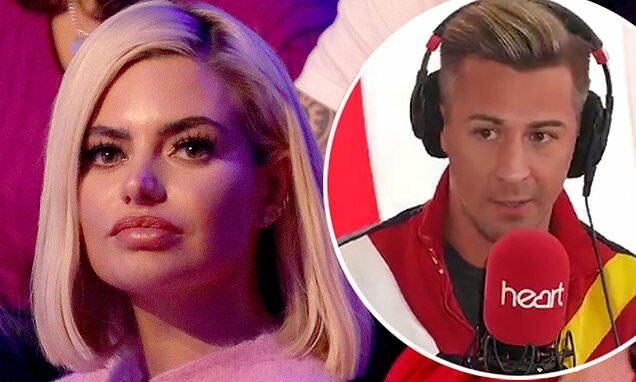 And Dancing On Ice professional Matt Evers stoked the flames with his nemesis as he hit out at the 'sour' Love Island star during an appearance on Heart Radio on Monday, as he told her to 'enjoy life' and 'support' her boyfriend, Wes Nelson. The 42-year-old skater made the comments after viewers suggested Megan, 24, had looked less than impressed as Wes, 21, took to the rink with his newly-single partner Vanessa Bauer during Sunday's show. 'This is really awkward', Matt admitted, adding: 'Her and I aren’t necessarily best of friends through things that she has said about our show previously. Suggesting the star didn't appear to be supporting her boyfriend, he added: 'She did look a little bit sour last night. During Sunday night's episode of the show Megan sat in the audience showing her full support for her boyfriend, however some fans hinted that she wasn't happy with some of the comments made by the judge's surrounding Wes' partnership.